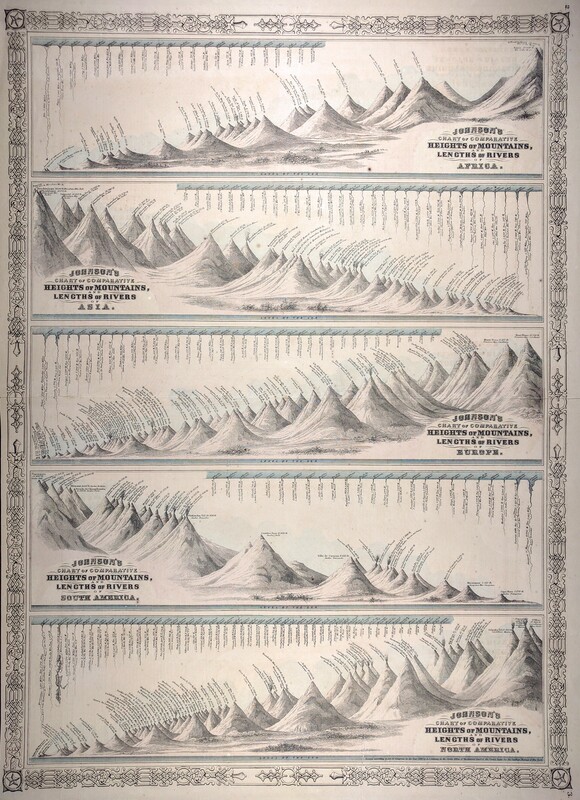 A small group of mountains comparatives were made for seemingly industrial/scientific purposes, rather than for education of the general public as most of these unique antiquarian maps were. The distinction between the educational and orological (that is, pertaining to the study of mountains) styles literally being in the shape of the mountains and their target audiences. 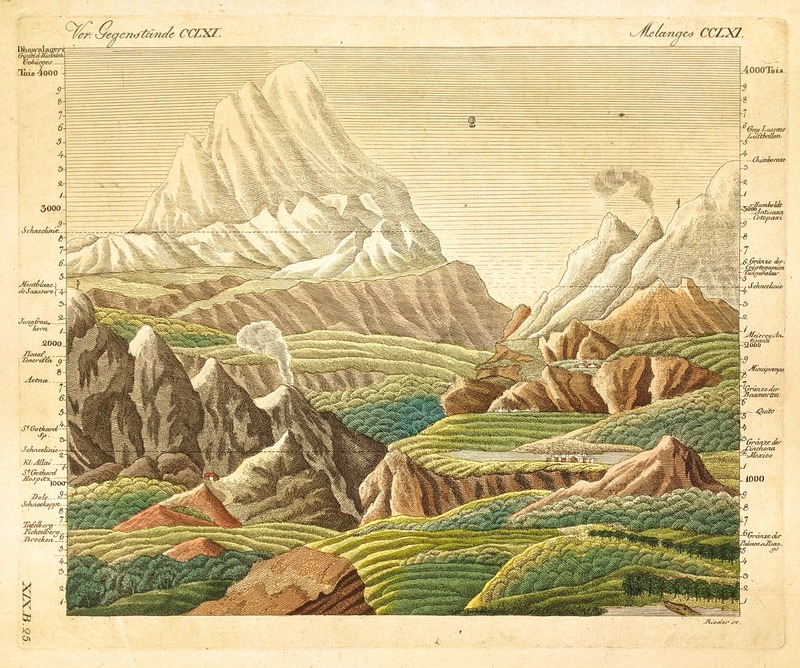 The earliest mountains comparative views, between 1810 and the early 1820s, were fictionalized landscapes, followed by the convention adopted where mountains were depicted as fictionalized cones (I term this the educational style), this after the landscape style. 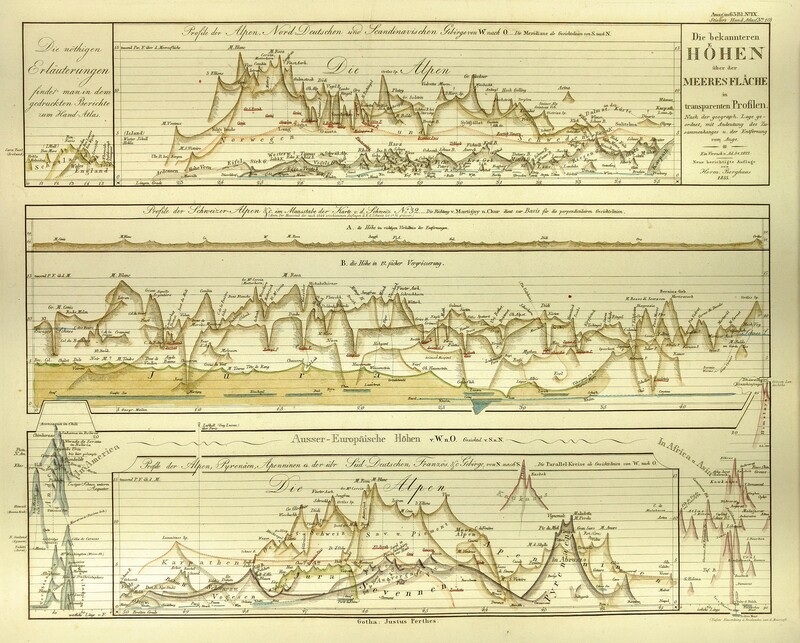 A few orological comparative maps emerged, were the cartographer preserved the cross-section of the peak, at about the same time that the simplified cone shape became widespread. 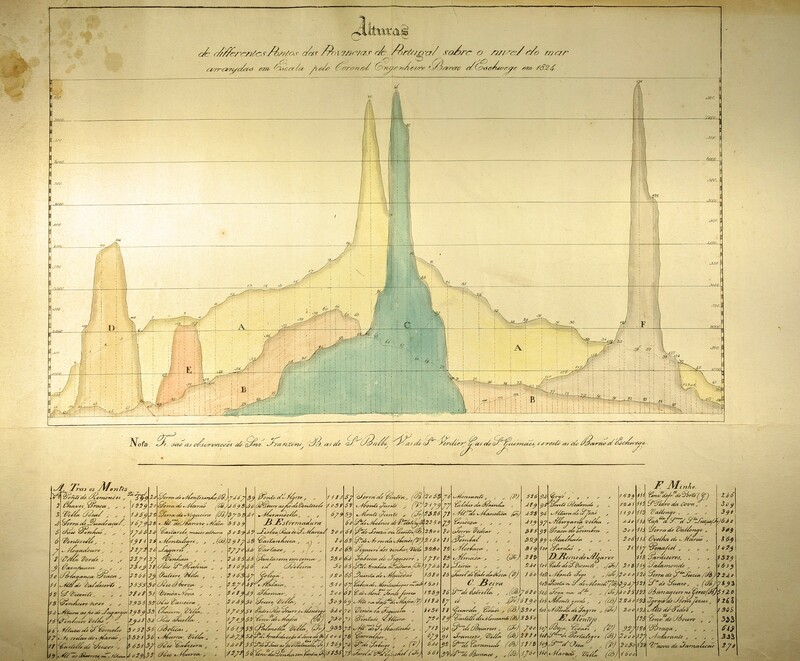 This orological style manuscript map, by an unknown cartographer, c1824, shows mountains in Portugal in cross-section. Based on the work of von Eschwege. (Photo: Own work). We can imagine the family tree of mountains comparatives branching in the 1820s with the educational and orological limbs diverging from the landscape trunk. In contemplating this split, in combination with the fact that the landscape style virtually died out, we can infer that simultaneously cartographers of different objectives learned of comparatives and incorporated the concept into pieces that met their distinct needs. The purpose of the educational style being to bring the public at large information about the heights of mountains, they gave dimension to figures previously relegated to tables, where a simple cone would suffice in illustrating the mountains. Conversely, the orological style was to document the physical properties, beyond altitude, of the peaks for use by an audience requiring more detailed information. The orological users may have required these charts for reasons related to mineral mining, among other plausible needs. The manuscript orological piece carrying von Eschwere’s data from his work in Portugal was likely prepared for mining purposes given his work. Stieler’s orological style Known Heights Above Sea Level, c1855. Mountain ranges are shown one atop the next. (Photo: Own work). Alternatively, it is possible that some of these orological charts were prepared for navigational purposes. Journeying across a continent on a scientific exploration, or perhaps laying a railroad, the heights of the mountains, and the locations of passes, would be of utmost importance. Evidence exists that these charts might serve such a purpose exists in their scale. The orological charts are often, if not always, of different scales horizontally versus vertically, meaning that the heights of mountains may be accurately represented, but not their widths. It stands to reason that a chart for use in planning a mine would maintain consistency between horizontal and vertical scales so as to accurately depict the mineral seam. The fact of differing scales may mean that the variation in height across the mountain may have been of utmost importance. Orological style charts are few and far between–and this is in the context of the already obscure comparative genre. This is too bad. They are a unique application of a beautiful discipline of mapping. Moreover, they stand as testimony to the value of comparative views as more than delightful pictures, but as serious tools for documenting the surface of the for industrial purposes. But why were they drawn?